For many years now in Guyana and some Caribbean countries (and even here in Toronto), there have been annual events recalling the first arrivals of indentured labourers from India and honouring their invaluable contribution to the sugar industry in the region. Billed as “1838: Brown Sugar – A Fundraiser for Children of Guyana”, the funds raised by this event are earmarked to assist, in particular, the children of the employees of Skeldon (Berbice, Guyana) Sugar Estate who are facing economic hardships and whose incomes have been severely impacted by the closure of the estate at the end of 2017. Established since 1890 and replaced by a state-of-the-art facility in 2009, it was shut down as a result of not achieving its annual production target caused by several factors, including managerial and technical problems. Mohan Ragbeer, physician, author and columnist for Toronto’s Indo Caribbean World newspaper, was the keynote speaker at the event. His talk on ”sugar”, supported visually throughout by a slide-show, was very well received by the many guests present. Introducing his topic he gave a brief history of sugar production as a profitable enterprise in several countries around the globe dating back to many centuries ago. He stated that it was first introduced to Madeira in 1425, thence to the New World (Hispaniola) in 1501. The Dutch in1658 established the first plantation in the Pomeroon, Essequibo and later in Demerary (known today as Demerara). In the mid-18th century the governor of Demerary, Laurens Storm van’s Gravesande, invited British settlers who established many coastal plantations in Demerara, adding to those in Berbice and Essequibo; African slaves provided the labour for the plantation owners until their full emancipation in 1838. He pointed out that following emancipation the British plantation owners suffered a decline in sugar profits with some estates becoming bankrupt. Survivors sought cheap labourers from other sources to replace the majority of the freed slaves. That led to the recruitment of Indian labourers under an indentureship contract, and the ensuing immigration to British Guiana, beginning in 1838 (396 labourers) and continuing until 1917 (238,940 labourers). The immigrants, he added, were enticed by the promise of a better life compared to the poor environmental, economic and social conditions they faced at the time in India. After enduring the long and arduous trip to British Guiana aboard the SS Whitby and the SS Hesperus, the first immigrants arrived on May 5, 1838. He observed that a once- thriving industry, built on the backs of African slaves and Indian indentured labourers, no longer plays a major part in the Guyanese economy. Sugar revenue in 2012 provided 80% of Guyana’s foreign exchange, he stated , but over the years since then that figure has declined considerably. However, he emphasized that the contributions of the Indian labourers since 1838 and those of the African slaves before them, in building Guyana’s sugar industry cannot be ignored. Dr. Ragbeer’s talk was followed by the presentation of awards by Ms. Anyin Choo, Guyana’s Consul General to Toronto. Before doing so, she stressed the important role of Education in society and complimented Mr. Habeeb Alli and “One Love Media” for their fundraising efforts to assist Guyana’s children in their educational pursuits. She then presented awards to Ms. Sara Singh, MPP for Brampton,Ontario, for her achievement in politics, and to Mr. Aftab Maxi Shamsudden (in absentia) for his accomplishments in the field of cricket. A sumptuous South Asian buffet dinner and dancing followed to round off the evening’s proceedings. 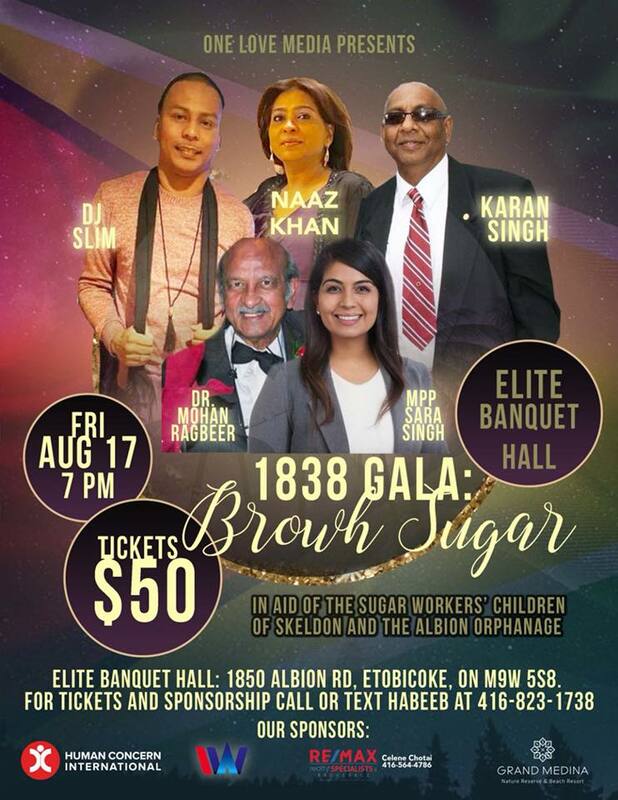 The “Brown Sugar Fundraiser” is one of two events that “One Love Media” has arranged this year to benefit children in Guyana. Mr. Habeeb Alli has since travelled to Skeldon where he presented backpacks and school supplies to 250 poor students for the new school year this September. They will also be receiving, as part of a school-feeding programme, daily lunches during September. He also donated some of the funds raised to the Orphanage at Albion, Berbice.